The arts and music tour began early last month and will include 10-stops around the state. For example the kickoff event was in Sacramento on August 6th. 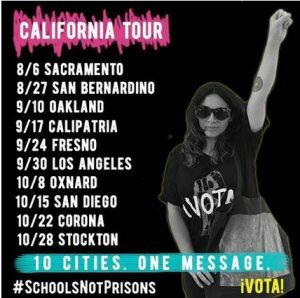 The tour is supporting the purposeful and peaceful mobilization of young people and hearing their calls for a society that prizes investments in education, wellness, prevention, jobs and housing more than the construction of prisons. Indeed, each prisoner costs $62,300 per year as opposed to $9,100 per year per student on average. These numbers are according to the Californians for Safety and Justice. A number of pop rappers, dancers, and musicians such as Los Rakas, Mariachi Arcoiris, Low Leaf, Audio Push, Kimya Dawson, Rocky Rivera, Orijanus, Mystic, and local performers are featured. Learn what you can do to prevent school push-out and criminalization of youth. 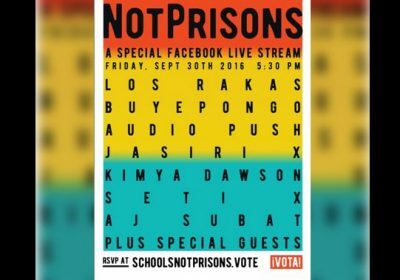 Visit the website: SchoolsNotPrisons.Vote for more information. Tonight the entire event will be live-streamed on Facebook.